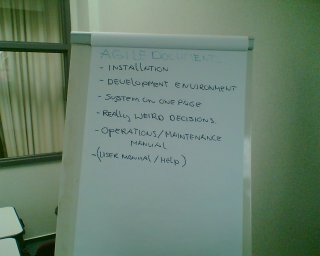 The last session of the first day was about Agile Documentation. This wasn’t a session someone had prepared in advance. We discussed a bit about the topic. At first, there was a bit of confusion about what we were talking about. Part of the discussion was really about requirements. What information do you need to start the project or to determine the impact of new requirements upon the system. Another part was about what documents we need to write during and after the project. What documentation do you wish for? At the end of the session, someone asked the question “If you arrived on a project, what documentation would you wish to be there?”. The image contains the list of what we wanted. We quite liked to have an installation manual and documentation about the development environment, to be able to see the application and get stuck in developing some new stuff. To understand the big picture, we like to see the “system on one page” and some explanation of all the (seemingly) weird decisions that have been taken during the project. For people outside of the development team we recommend an operations/maintenance manual, which contains all the information you need to keep the application running. Some users might need a user manual or online help.